In factory floors, warehouses, store yards and other areas where heavy equipment or supplies must be regularly moved from one place to another, permanent industrial cranes make possible the easy and safe movement of objects. Bridge Cranes – Gorbel Inc.
Bridge cranes are essential parts of many industrial operations. In the steel industry, bridge cranes are used to suspend and pour raw steel materials into furnaces. They are also used to remove shaped steel beams to storage areas as well as prepare them for shipment. Bridge cranes of variable sizes are used in the automotive industry for heavy duty and light duty fabrication processes. In the paper milling industry, large rolls of paper are transported by bridge cranes for shipment and storage. Bridge cranes are an efficient, often higher-performance alternative to other load moving tools like fork-lifts and hi-lows. Mobile, floor-based load bearing tools like forklifts require enough clearance to move around effectively and safely. They also require independent energy sources like batteries or natural gas reservoirs, both of which can be expensive. Bridge cranes eliminate the need for using space in this way and can be permanently connected to power sources. 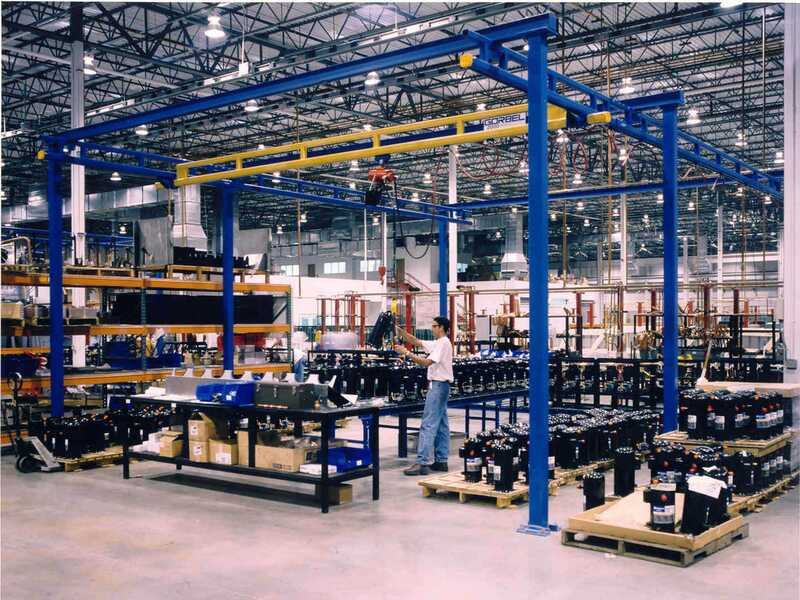 Bridge crane systems involve several parts, the most important of which is the crane itself. The crane involves a winch, which allows the lowering and retraction of tension cables down to workspace floors where they can be attached to loads. In more automated models, robotic arms are used instead of cables. In either case, the crane mechanism is mounted on a specially designed steel girder, the ends of which are equipped with rollers. The girder moves forward and backward over two beams that are parallel to each other and perpendicular to the girder. The beams support the girder and the load from the crane. They also make the girder’s movement possible. The crane itself is also equipped with rollers, and it can move back and forth across the girder. The combination of lateral and linear motion gives the crane access to almost the entire floor in a workspace. In some cases, as is more common in outdoor, non-permanent materials movement operations, bridge cranes can be equipped with roller systems at the bottoms of their support beams, which allows for the entire mechanism to move relative to the ground. Such designs can be assembled on site for construction purposes, waste area clean up and other heavy duty materials movement operations. Mobile bridge cranes are sometimes called gantry cranes, and stationary gantry cranes are sometimes described as bridge cranes. Generally, permanent, structurally supported parallel girder cranes are considered to be bridge cranes, while gantry cranes are more likely to be free standing and mobile. Bridge Cranes Bridge cranes are materials movement tools used for the transportation of very heavy or large objects during construction, shipping or storage. They are suspended high above workplace floors on beams.